Police Auxiliary officers are unpaid volunteers who are called upon to supplement police department work as needed. Although members do not perform the full range of duties of a law officer and do not carry a gun, they take part in other efforts that preserve peace and order, prevent crime and protect life and property. “The Orangetown Police Auxiliary Unit acts as the ‘eyes and ears’ of the police department . 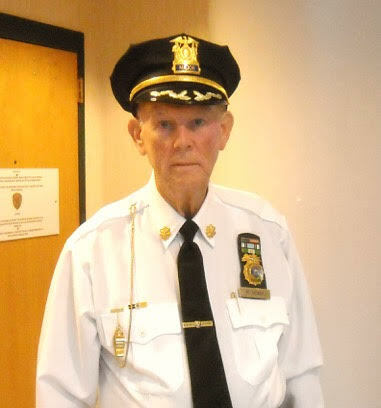 We wear blue uniforms to provide a presence and if something happens we call it in,” Major Marshall Becker, this week’s Unsung Hero, told the Rockland County Times. Becker explained that handcuffs placed in front make it much easier for the suspect to attempt to pick the lock, open them with a universal handcuff key or even use their arms as a weapon. An officer’s first line of defense is to cuff the hands behind the back. Police recruits are typically taught to apply cuffs, so that the palms of the suspect’s hands, already behind their back, face outwards with the thumbs up. This makes it more difficult for the hands and fingers to work together to pick or escape from the cuffs. Pepper spray is made from an extract of chili peppers and usually comes in an aerosol canister, so it can be sprayed quickly and easily. Since it is portable and easy to use, pepper spray is a popular option for both law enforcement and personal use. When sprayed into the face of an attacker, it is extremely irritating to the skin, eyes, mouth, throat and lungs. Its effect is immediate and it can distract a person long enough for a police officer to take control of a subject. “Traffic control is essential at an accident scene (situation #107) to prevent further mishaps or injuries. Rerouting vehicles around the accident scene is the most common procedure used and spectators or unnecessary personnel are cleared from the scene. We carry a long light-tube, have a whistle, reflective gloves and a vest. If a motorist does not obey commands, we take down the license plate number and call it in to the Police Department,” Becker continued. “There are four main events we work at that include the Italian Festival, St. Patrick’s Day Parade, July 4 Fireworks and the Greek Festival. As a major, I call in the Administrative Captain, we sit down and work out a plan for each event, then Lieutenants and Sergeants are called in and the duties are given to each squad. We have an active group of 35 members and each member gets boots, summer and winter shoes, summer and winter pants, shirts, sweater, jacket, hat and badge. One type of patrol is a ‘house check’ where the Police Auxiliary member walks around a house to check on a request made by a homeowner. Anyone interested in joining the Orangetown Police Auxiliary Unit can e-mail Lt. Mitch Saul at otauxpd@verizon.net or call 845-359-7395 x 3770.